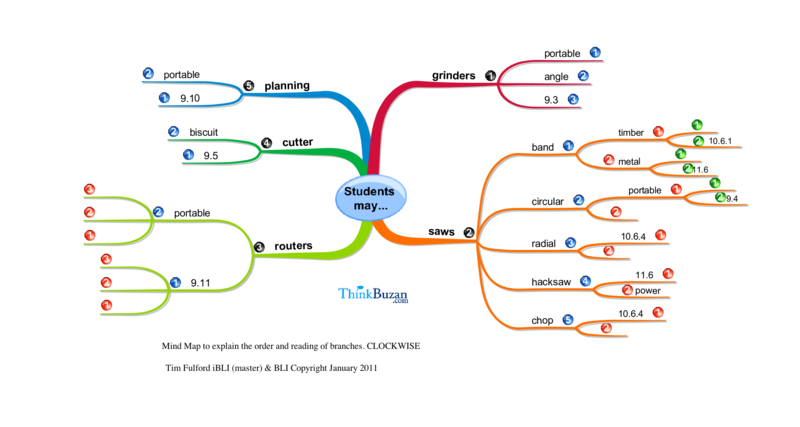 How to read and write a mind map: clockwise or counter–clockwise ? Getting in touch with other mind mappers has allowed me to think over some rules of mind mapping. and while reading his maps I noticed something particular related to the direction to follow when reading. Everybody knows that a mind map is written/read clockwise. when from branches 3 and 4 you draw the sub-branches. After that, how can we go on? Clockwise, that is from the bottom to the top? Or counter–clockwise, that is from the top to the bottom ? First of all I have to say that there is no rule which states which direction you should write a map and therefore it is not true to say that everyone knows this. However I have always worked clockwise starting at 1 and going round the face. It is not good practice to have more than 7-8 first order branches so it is unlikely that you would run out of space. The second and third level branches should, in my opinion, go clockwise as was well. The reason for stating this is that when you come to read a map, particularly when using it to presenting from, the brain gets confused when you go past six o’clock and suddenly start using second order branches in a counter clockwise direction. I have looked quite carefully at why people suddenly start using a counterclockwise technique and it because if we were making a list we would start at the top and work downwards. Unfortunately most software cannot cope with the effective change in direction and starts to run counter clockwise. I have also found that most left handers like to run their maps counter clockwise. While I have no particular issue with this or left handers it does not make sharing maps easier. I liken it to the way in which we produce text in linear form which is top left to bottom right in a snake like, line by line pattern. If we suddenly did something different from the convention it would create reading and communication issues. There is no reason to do this. In all my training sessions I encourage my delegates to run their maps clockwise for all levels of the branches to make reading and sharing easier.